Read the Google Reviews of Dr. Lisa Walmsley. Welcome to Absolute Chiropractic proudly serving the Herndon and Reston communities for 24 years. Dr. Lisa Walmsley helps you safely recover from injury and optimize your wellness through natural and non-invasive treatments. Her wholistic approach to wellness helps patients manage back pain, neck pain, and headaches without the dependency on painkillers. Look no further for a safe alternative to medication and invasive surgery. Added nutritional guidelines and exercise instruction included. Little to no wait times and emergency appointments anytime upon request. 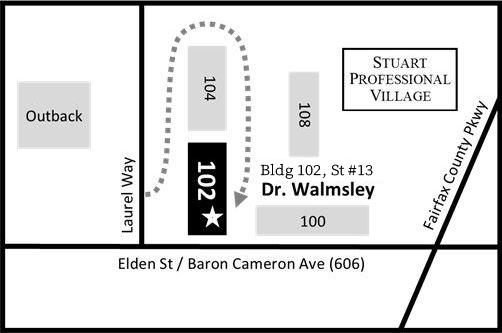 Dr. Walmsley's Herndon Chiropractic practice is conveniently located just one mile from Reston Town Center! Call us today at 703-742-5470 to schedule a chiropractic appointment or Request an appointment here. and are in not affiliated with our company, nor do they endorse or sponsor our materials. *Additional appointment times available upon request. Dr. Walmsley engages a whole body' approach to wellness, which means she focuses on treating the underlying causes of pain and illness, rather than just treating the surface symptoms. Dr. Walmsley is an expert in Auto Accident Coverage, Pregnant Woman Care, Children Scoliosis, Back Pain Relief, Neck Pain Relief, Headache Relief, and Nerve Pain Relief. "Dr. Walmsley is a miracle worker! After weeks of suffering and bad to no advice from medical doctors, I have fully recovered from my neck pain. She educated me on lifestyle changes and to the benefits of maintenance care. I don't want to go through those symptoms EVER again. I come in for a "tune-up " just to keep moving. Don't delay!"